There are a lot of hidden settings in Mac OS X that you can change by using the Apple Terminal, but if you're not familiar with it, it can be tricky. Mountain Tweaks and Lion Tweaks are two apps created by Fredrik Wiker that cut out the extra step by letting you change those settings without having to use Terminal, therefore making it ridiculously simple. 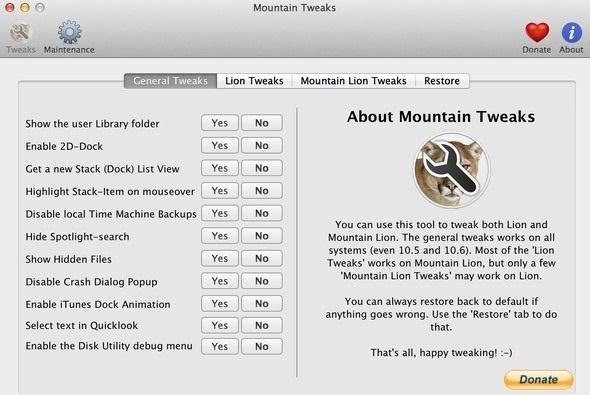 Since Mountain Lion is the latest version of OS X, we'll focus on Mountain Tweaks. There are three categories of tweaks. General Tweaks are compatible across all recent OS X versions, including Leopard and Snow Leopard. 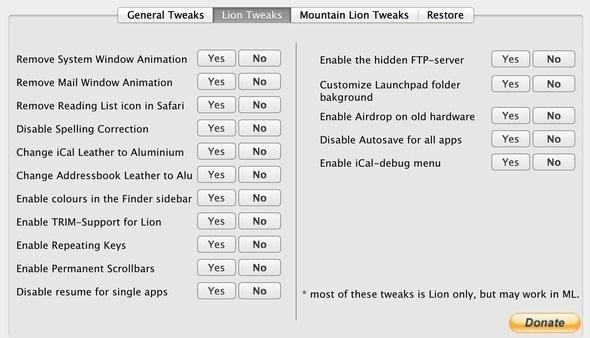 Lion Tweaks and Mountain Lion Tweaks are version-specific, but some of the ones for Lion also work in Mountain Lion. Mostly, it's a way to change some of the little things that annoy you. You won't find any tweaks that significantly enhance performance, but if you hate spelling correction or smooth scrolling, or just want to change the look of something, it's definitely worth a free download. The easiest way to decide if the app would be useful to you is to just take a look through the screenshots. And if you change something and hate it, you can easily revert back to default settings by clicking the Restore tab. To try it for yourself—head over to Fredrik's website. Do any of the tweaks in this app solve one of your pet peeves? Tell us what you'd use it for in the comments.